The cost of Metrorail may derail its own existence, inevitably causing the project to unravel under its own financial weight, according to local business leaders. Representatives from several of Northern Virginia’s business organizations and task forces – ranging from local chambers of commerce to the Washington Airports Task Force and the Associated Builders and Contractors Virginia Chapter – released a joint letter July 23 decrying Phase II of the Dulles Corridor Metrorail project because of its exorbitant costs, among other things. The total cost of the project is estimated to be around $3.5 billion. The representatives called for the Metropolitan Washington Airports Authority’s Board of Directors to make significant cost reductions in Phase II of the project that includes the Silver line extension that will terminate in Ashburn. MWAA’s Board of Directors is holding its own meetings concerning Phase II of the project this week. 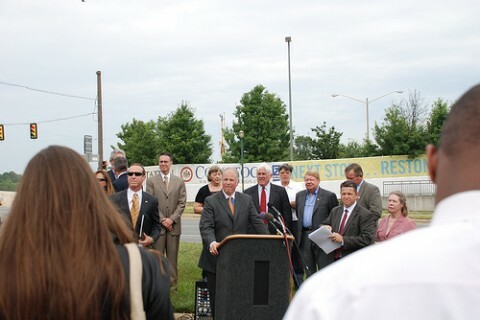 At a press conference in front of the soon-to-be constructed Wiehle Avenue Metro station in Reston on Thursday, Kurt Krause of the Northern Virginia Transportation Alliance spoke on behalf of a group of nearly 20 businessmen and women who co-signed the letter to MWAA. Ninety percent of the Metrorail construction will be funded by real estate taxes, business license taxes and tolls, Krause said. “Our collective stake in completing Phase II could not be greater,” he said. Loudoun County Chamber of Commerce President Tony Howard, Fairfax County Chamber of Commerce President Jim Corcoran, Dulles Regional Chamber of Commerce President Eileen Curtis and Greater Reston Chamber of Commerce President Mark Ingrao detailed five areas they believe MWAA could make cost reductions resulting in nearly $1 billion in savings. The first is a call for MWAA to eliminate its requirement that the primary contractor for the project implement a mandatory Project Labor Agreement on Phase II. The enforcement of a PLA would discourage bidding on the project, thereby potentially increasing the overall cost 12 to 15 percent, according to Howard. Curtis spoke against MWAA’s recent decision to build an underground instead of the originial above-ground Metro station at Dulles International Airport, which increased the project’s overall cost by $300 million. “The decision to construct an underground station is not only more expensive … it will reduce the Authority’s capacity to support the funding and construction of its tier-2 midfield terminal, which is essential to Dulles Airport’s growth as an international gateway and our region’s link to world markets,” she said. The group also requested MWAA reduce the scope of its rail yard at Dulles Airport and seek ways to finance it separately or in conjunction with the Washington Metropolitan Area Transit Authority, which could save between $50-$100 million. The business leaders also would like to see Fairfax and Loudoun counties assume responsibility for funding and construction of the parking structures, which is similar to the public-private partnership at the Wiehle Avenue station. Lastly, the group asks that the Authority seek additional financial aide from Virginia and the Federal Government. “By allowing Fairfax and Loudoun County to engage in public-private partnerships to construct the parking garages, altering the configuration of the Dulles Airport rail yard … the project costs for Phase II can be reduced by hundreds of millions of dollars,” Corcoran said. The co-signers of the letter to MWAA have yet to receive a response from the Authority.